When the Curiosity Rover arrived on Mars in 2012, I had put together a collection of useful links about the Mars missions, but I hadn’t updated it in a long time Recently, I got some questions about Mars on Google+ after posting one of the raw images from Curiosity and I think it’s time now for a revised edition of the link list so everyone can stay updated on their own. I originally started the list as a way provide all the information without having to write constantly about the Mars missions myself, something which others are doing much better. Nowadays I share all the space news on Google+ and specifically my Space and Astronomy Collection in addition to the WSH Crew Community. 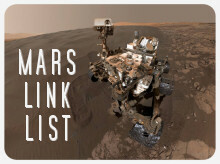 This is a completely redone edition of the link list, this time not only including NASA sites, but also the Mars missions from other agencies.